It’s a case of one down, two to go for the West Coast Eagles are successfully landing the signature of one of their 2018 free agents. Jeremy McGovern will be sticking with the club until at least the end of 2023, having signed a five-year contract despite strong rival interest. “It’s good news; I’m just stoked to be staying at the club,” McGovern said. “I love the people at the club, the direction the club is taking and it’s exciting to be a part of that. “I’m grateful for the opportunity the club has given me and it was a gut decision to extend my contract. It would have been nice to have locked it away a bit earlier, but these things take time. Crosstown rivals Fremantle were believed to be strongly interested in poaching McGovern from the Eagles, and St Kilda and Sydney had also been rumoured to be in pursuit. The Dockers and Saints were both reportedly willing to offer McGovern deals in excess of $1 million per season. It’s believed that he has re-signed with the Eagles for a deal worth approximately $5 million over five years. The Eagles’ initial offer reported earlier in the season was said to be $4 million over the same length of time. If those figures are accurate then it appears that, like Dustin Martin before him, McGovern has used his free agent status expertly to get the maximum value out of his contract. 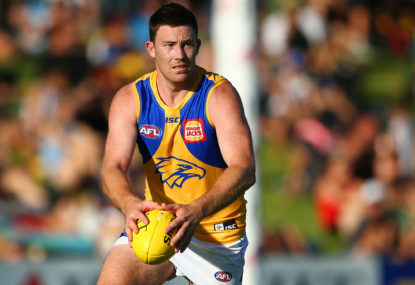 West Coast will now turn their attention towards re-signing Andrew Gaff and Scott Lycett. Gaff is a Brownlow contender in 2018 playing career-best form and has attracted strong interest from a number of Victorian clubs, with Melbourne believed to be leading the race if he decides to move. However recent rumours suggest the Demons don’t expect Gaff to be coming to them and are instead focused on re-signing breakout star Angus Brayshaw. Lycett meanwhile has become a more difficult prospect for West Coast to work out after a second ACL injury to Nic Naitanui. His value has skyrocketed as a result, but the Eagles will have to balance re-signing him with looking to retain Gaff, and keeping an eye on the fact that Naitanui himself is out of contract at the end of 2019.